We really stretched the pasta tonight by adding a bunch of vegetables. I sautéed the mushrooms, onions, garlic, and carrots while the pasta cooked. John toasted some sesame seeds and chopped up some green onions. Right before the farfalle was done I added some pasta water to my pan and started the broccoli. This way the broccoli retained its color and texture. Add the farfalle to the vegetables, as much peanut sauce as you like, and some more pasta water for a good consistency. 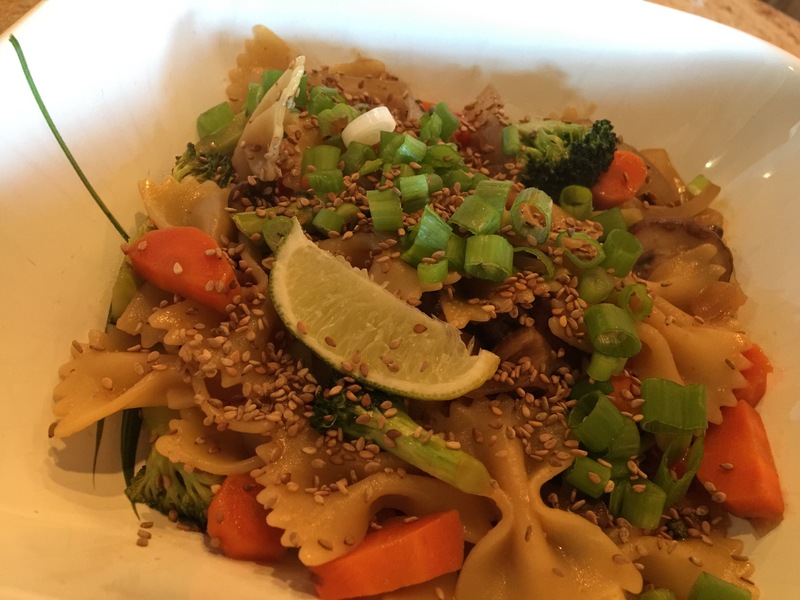 This entry was posted in Vegan, Vegetables, Vegetarian and tagged broccoli, carrots, farfalle, green onions, mushrooms, Onions, pasta, sesame seeds, Vegan, Vegetables, vegetarian. Bookmark the permalink.